Physics Today, the flagship publication of the American Institute of Physics (AIP), is the most influential and closely followed physics magazine in the world. With authoritative features, full news coverage and analysis, and fresh perspectives on technological advances and groundbreaking research, Physics Today informs readers about science and its role in society. Members of the AAS, an AIP Member Society, automatically receive free print and online subscriptions to the magazine. 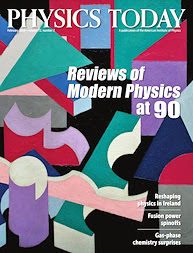 Physics Today Online, the magazine’s internet home, presents an enhanced digital edition and provides a valuable online archive.